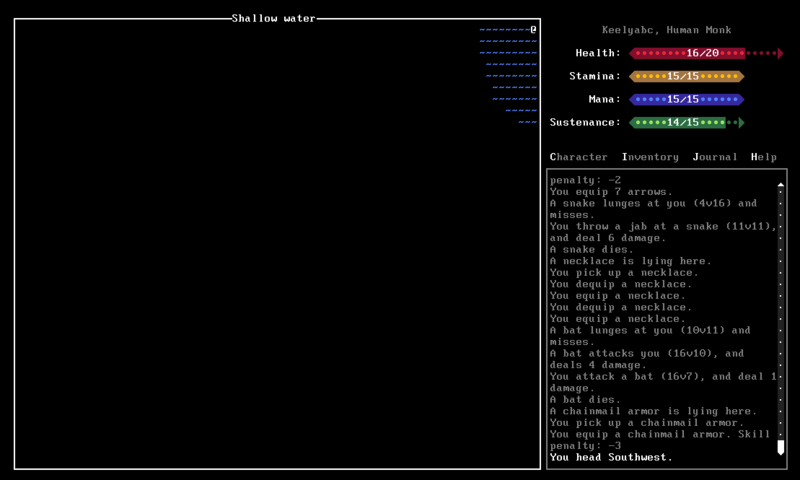 With the v0.6.136 release, Dance of Death began its movement towards a more wilderness-survival-centered gameplay rather than the dungeon crawling of traditional roguelikes. I loves me a good dungeon crawl, but what I can really sink my teeth into is an open world where your progress is only limited by your character’s skills. That, and post-apocalyptic settings. I am not yet set on whether the world of Dance of Death will start to take a “post-apocalyptic fantasy” edge, but that is a discussion for a later time! Version 0.7 will continue to develop the core systems of the engine, introducing dynamic lighting and a day/night cycle, and reworking skills and items. Skills will mostly be reorganized and their behavior slightly tweaked, while items are due for a major rehaul as far as their properties and how they are equipped. These changes, in addition to player feedback and my own UX observations, will also require a number of interface updates. Finally, the world map will generate rivers and their corresponding areas, as well as take care of some minor bugs. Dynamic lighting system with colored lights and environmental lighting for times of day. Equippable light sources such as torches. Add [M]ap command to interface. Interface command keys should reflect custom mapped keys, if applicable. Rework large bars, small bars, and scrollbars to be consistent. Add rivers to world map. Remove exits to prevent the player from moving into a water-based area, as pointed out here. Review shades of blue colors so that the difference between deep and shallow water is once again notable. The 2010 ARRP release was a success, and I very much appreciate all of the support and feedback from the roguelike community. Please keep it coming! Dance of Death v0.6.136 Released! Excellent – looking forward to it, and I definitely dig the roguelike life beyond the dungeon crawl, too. Wow, very interesting game–it seemed more standard once one got into the dungeon, but the wilderness section was *very* creative! Moving always to the edge of the screen, and having topological arrows…very good. You could also have the topology arrows actually spaced out like in real maps (closer together for steeper terrain) and re-set the map each time you change a level that way too. Wow, I love your wilderness! Thanks for the Dance of Death love! I’ve got some fun plans for the wilderness moving ahead, starting with the day/night cycle this next release. Indeed, the maps are stored as areas with an X, Y, and Z value, so that digging down could potentially land you in a lower level! (Granted, there is no digging or such functionality there, but the current system would support it). I’ll be fleshing out the wilderness further with rivers, lakes, better monsters (some which only come out at night, etc.) as development proceeds. Currently, I’m in the middle of some other projects, but eagerly wanting to get back to Dance of Death (which should happen in about a month or so). So I just found your game. I checked, I have flash 10, but I can’t play it. Character creation works right up until I have to press enter to start the game, but nothing happens. Any ideas? Thanks for your feedback on Dance of Death. I have encountered the bug you mentioned, especially on Macs. Refreshing the page and trying again has worked for me as a quick fix, since I have been unable to track down what’s causing the problem. What OS, browser, and Flash Player version are you using? To check your Flash Player version, right click on any Flash container and click on the last option, “About Adobe Flash Player 10”. Game’s looking great but all your posts so far have been mostly gameplay related, can you provide some insight into the how the game is made? Specifically I’d love to know how you emulated the console look. Ditto on the console look- is there a flash implementation of curses? Chris and requerent, if you are interested in the screen drawing code I use in Dance of Death, Chronophase, and the currently-in-progress 7DRL The Adventurer’s Guild, take a look at the ever-popular World Generation Breakdown article (http://www.nolithius.com/game-development/world-generation-breakdown), which has source code listed at the bottom that includes the tile drawing classes. To my knowledge, the are no ActionScript curses. I have kicked around the idea of porting libtcod to Flash, although, more realistically, what I will end up doing is a more detailed post explaining how to draw the tiles, once my time frees up a bit. Tried the game out and it looks amazing. I was wondering if development is still moving on this game, considering how long it has been since a blog-update has been released. I understand how hard it can be to get going with little to no funding on a project like this, so I really hope this can get off the ground. Thank you for the Dance of Death love. It remains to date one of the most popular destinations on the site despite, as you’ve observed, having been last updated about 2 years ago. My plans for maintaining/picking back up Dance of Death are as follow: if my current game (Crossword Dungeon) does well on iPhone, I will grab myself an iPad and optimize it as a Universal App. If that does well, then I will look into porting it to Android. If that goes well, then the next incarnation of Dance of Death is likely to be a survival-based roguelike for tablets, using a lot of the characters/icons that I’ve drawn for Crossword Dungeon. It is between that and another idea I have in the works, for my next project. I’ll be focused on maintaining Crossword Dungeon for the next few months and will be sure to keep you updated as to my next project! I like many of your projects, but Dance of Death looks most promising! The interface is clean and handling is smooth. Your ideas about post-apocalyptic settings are great. Can’t wait to see this game evolving! Nice Work so far. Only two things I wanted to point out while I was playing and then I saw it was #14 (ohh so annoying with my first character that was really promising!) and #5 I just noticed that you don’t get XP and wondered how you could get better at armor and weapons and such. I sort of thought that XP was NOT given outside because the monsters are super easy. But when I killed the Red O in the dungeon and got no XP I was a bit confused, but here are the two answers on the page: #14 & #5. I really hope that work will continue on this, sometimes quick character does not let you go past the name screen…. but it looks very promising! a quick job on items and such would make this an endlessly replayable RL. I’d help but I still am trying to release a new slashem version (even though I have NO idea how to code). In about 3 months (hopefully less) I’ll be done with that. If I knew how to code for this dance of death project I’d be willing to help. Still lovely to play a few times every once and a while. I’d love to see a version 7 where most of the character classes were fully dialed in. It would also be nice to have a few randomly generated extra “caves” with one of them a different colour (denoting the end cave) so you could play it longer.